Aloha and welcome to the third in a four-part series exploring Hawai’i Island, otherwise known as The Big Island! In Part Two, we continued our journey on the south side of the island, visiting South Point, Na’alehu, Punalu’u Black Sand Beach, and Hawai’i Volcanoes National Park. 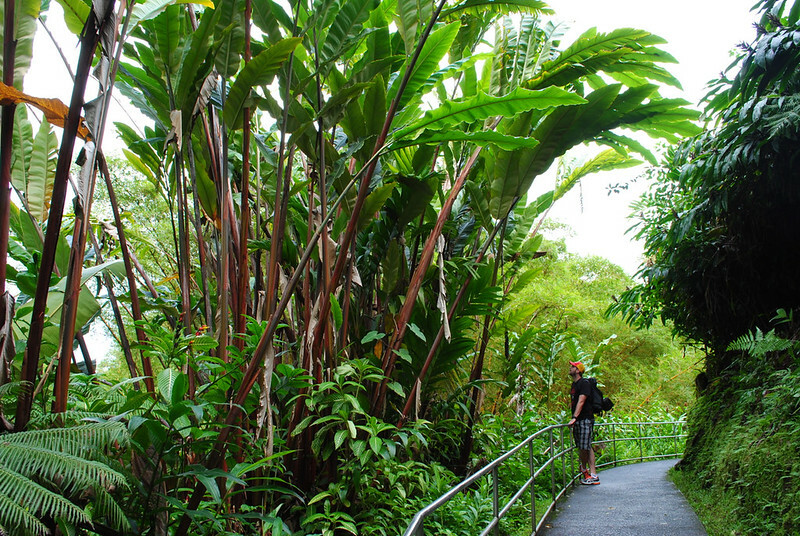 Today we’ll spend some time on the lush east side, exploring historic Hilo and a couple of can’t-miss adventures! Can I be honest with you for a moment? 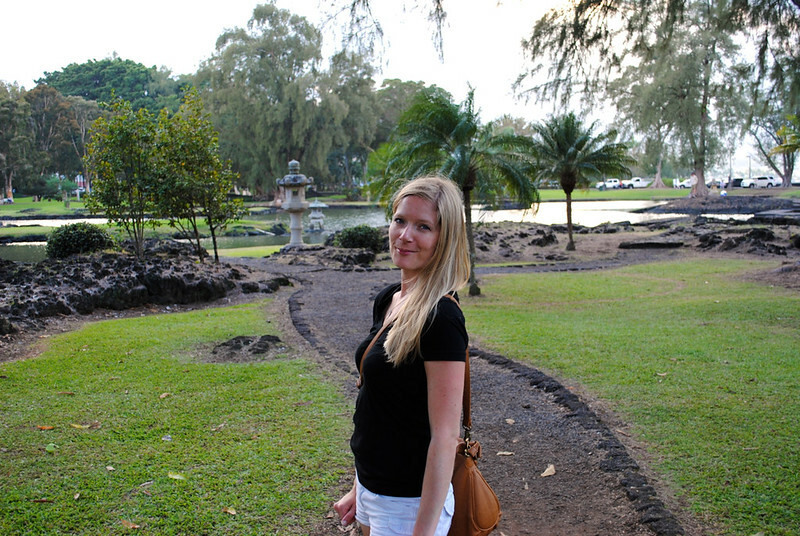 The first time we visited Hawai’i Island, and the city of Hilo in particular, I couldn’t get back to Kona fast enough. 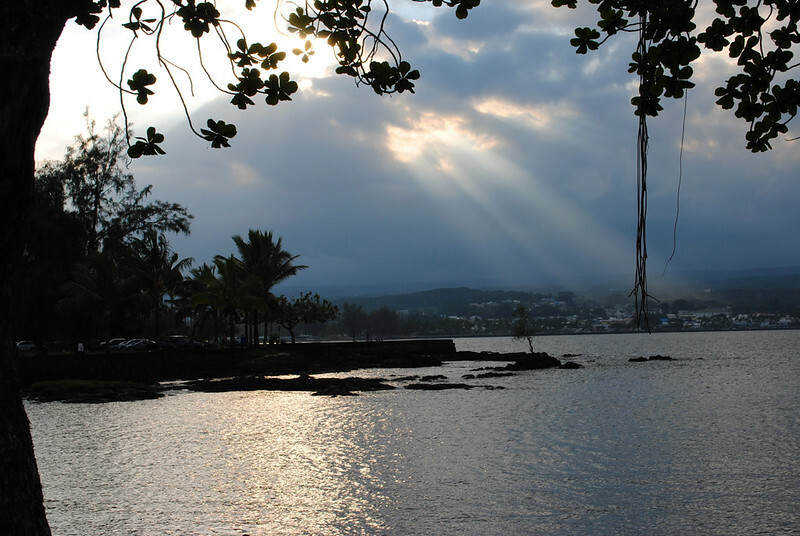 I had come to Hawai’i for heat and sunshine, and when we arrived in Hilo, it was rainy and wet. However, I gave it a second shot and I am so glad I did! 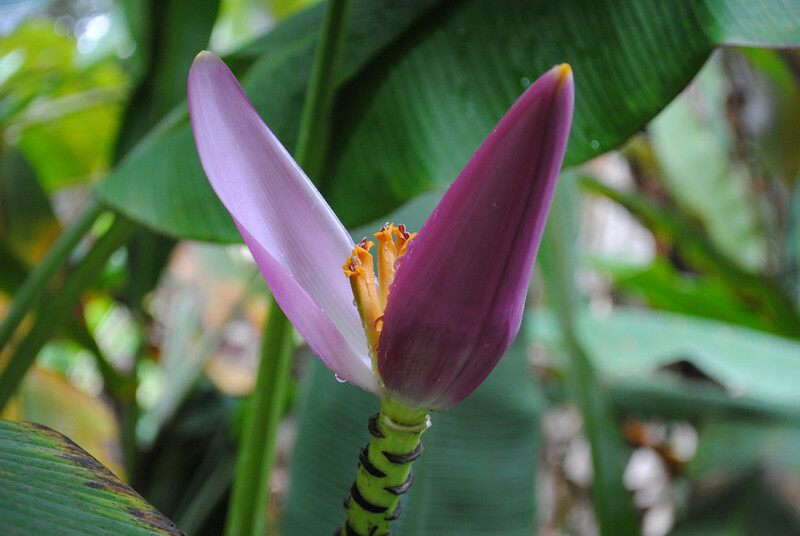 Please don’t let your preconceived notions of Hawai’i stop you from exploring and enjoying everything Hilo and the east side of the island have to offer. 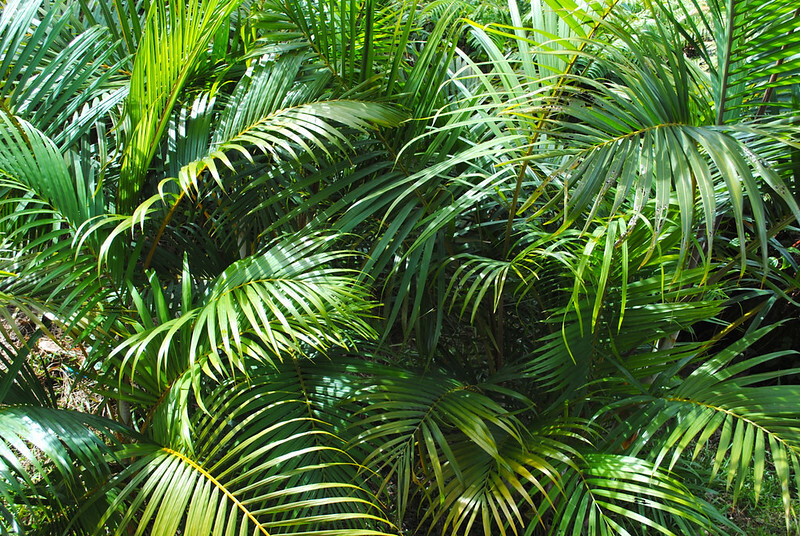 It’s a truly unique area of the island, surrounded by verdant jungles with some incredible opportunities for all kinds of visitors. 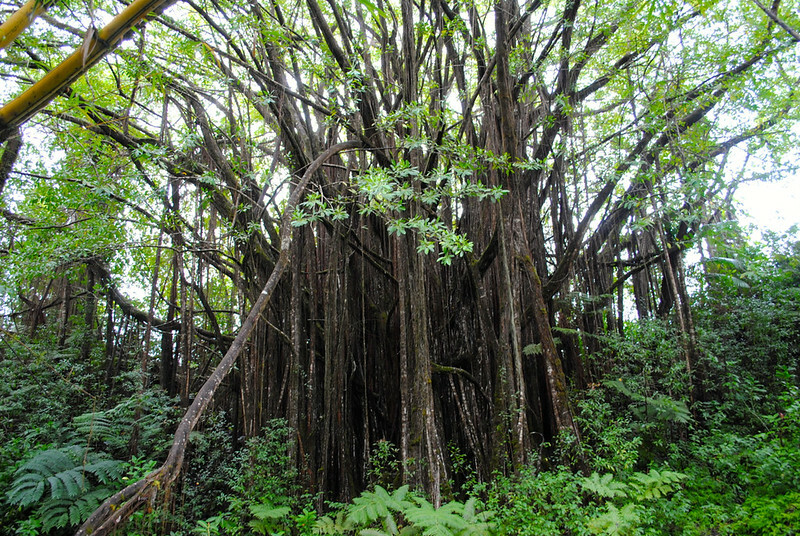 Hilo itself has a deep history. 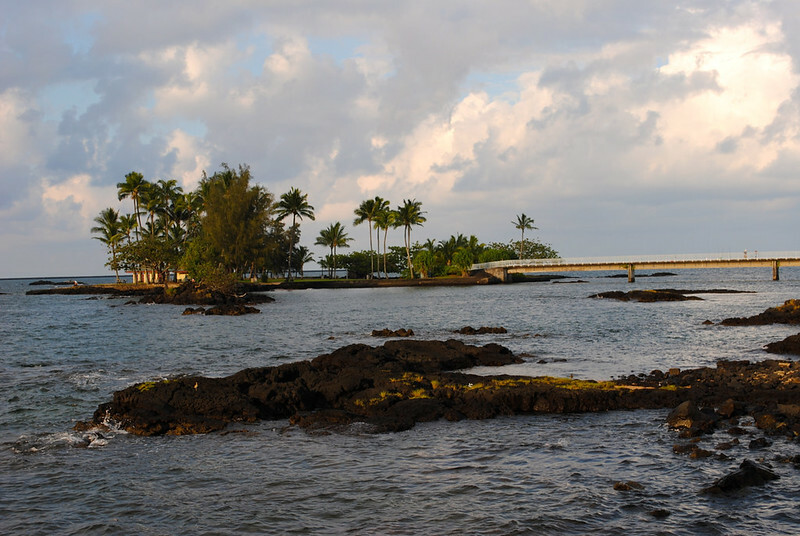 Hugging the shores of Hilo Bay, the area was first settled by Polynesians in 1100 AD and today is the county seat for Hawai’i County. 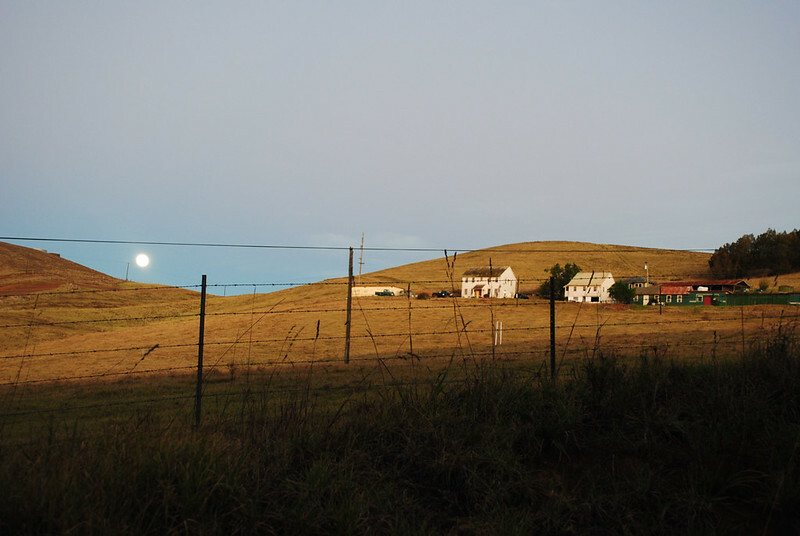 Its population is small but fiercely proud and undeniably delightful. While strolling the waterfront shops, we quickly saw the toll living on the Pacific Ocean has had on this city. 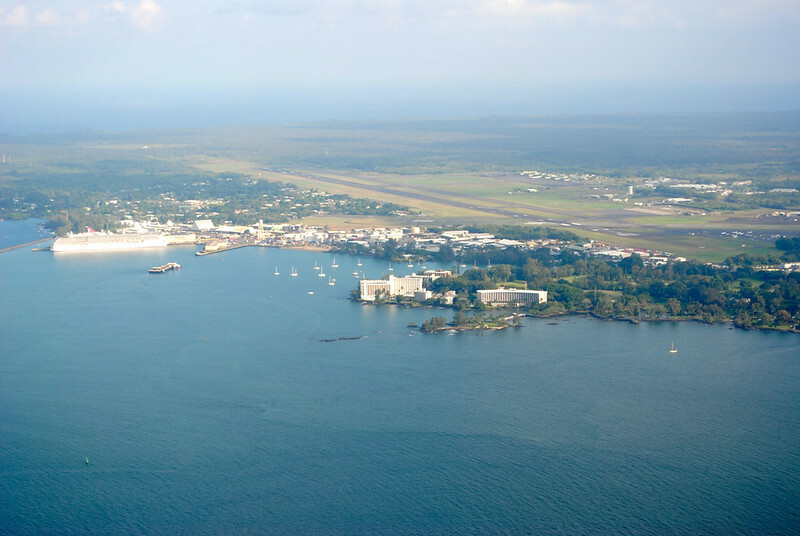 Tsunamis are no stranger to Hilo, but the city and its residents have shown unwavering resiliency in the face of Mother Nature. 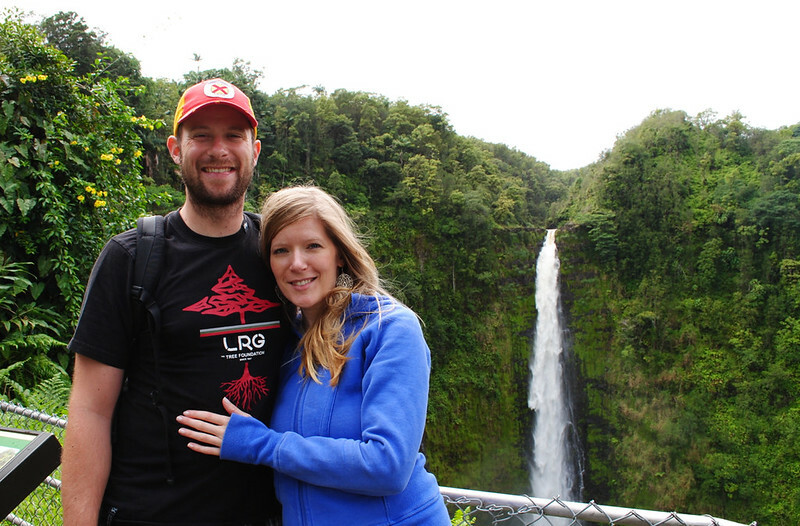 The east side of Hawai’i Island is the perfect place to take part in some pretty extreme eco-tourism, and my husband and I wouldn’t dream of missing out! 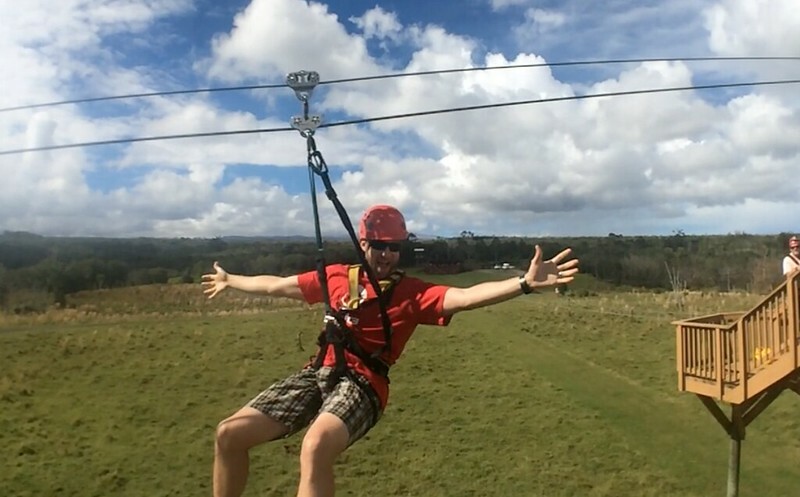 He had never ziplined before, so I made it a priority to book us in for a day with the crew at KapohoKine Adventures. 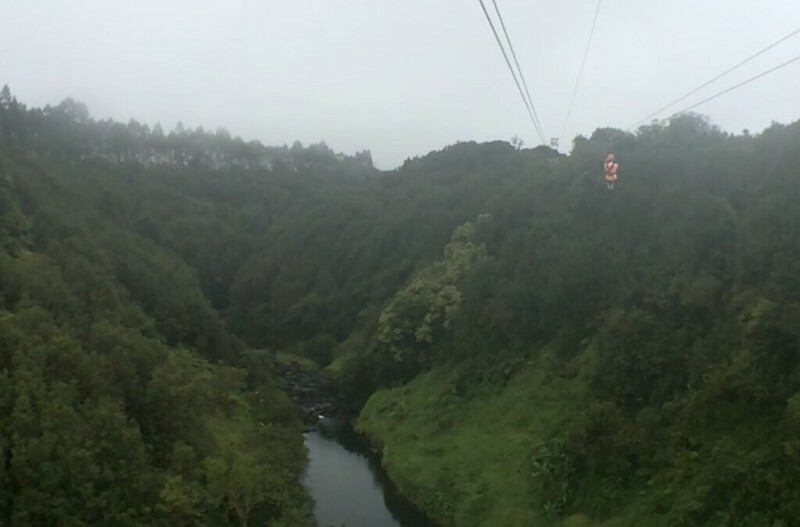 Our day began with a van ride along with our fellow zipliners, hosted by a hilarious tour guide who had no shortage of Hawaiian stories for us. 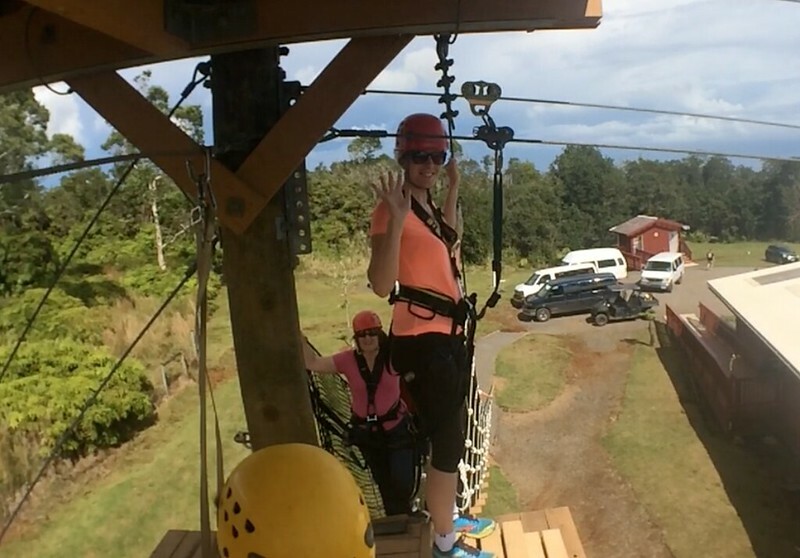 We soon found ourselves at the Zipline Through Paradise base, overlooking expansive pastures with views up to Mauna Kea and down across the ocean. 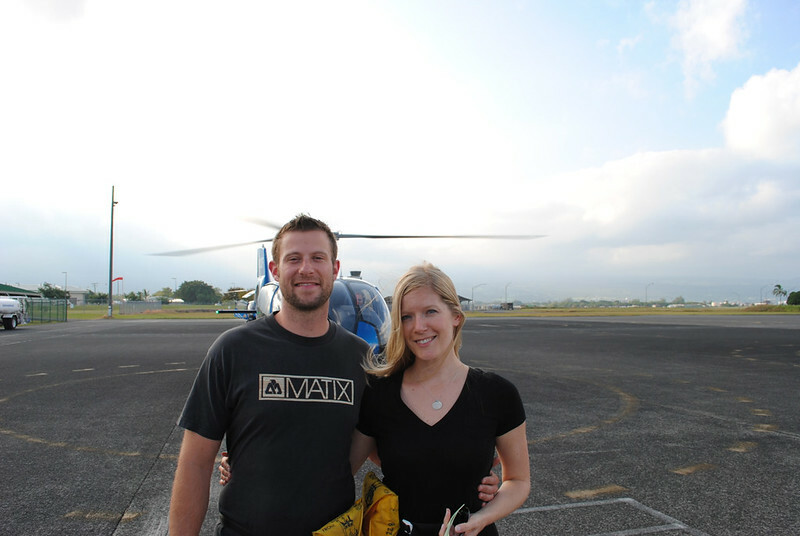 After covering the safety basics and being properly fitted for our harnesses and helmets, we were off! 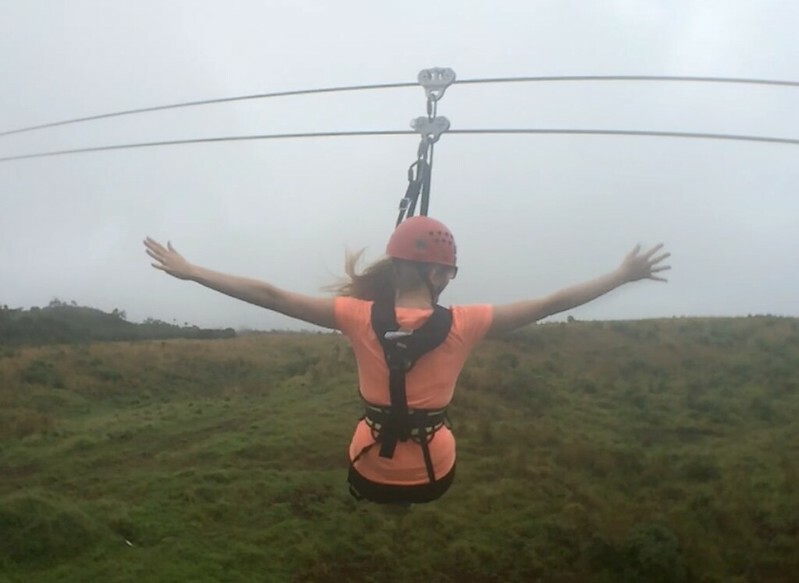 For those who have never ziplined before, the course starts of easy with short, low lines between towers. The course featured eight lines in total, all of them tandem, allowing my husband and I to race each other on every line. For the record, he always beat me to the other side. The lines gradually become longer and higher, finishing with the ultimate experience on the eighth line: more than half a mile across and as high as birds fly, the views are jaw-dropping. 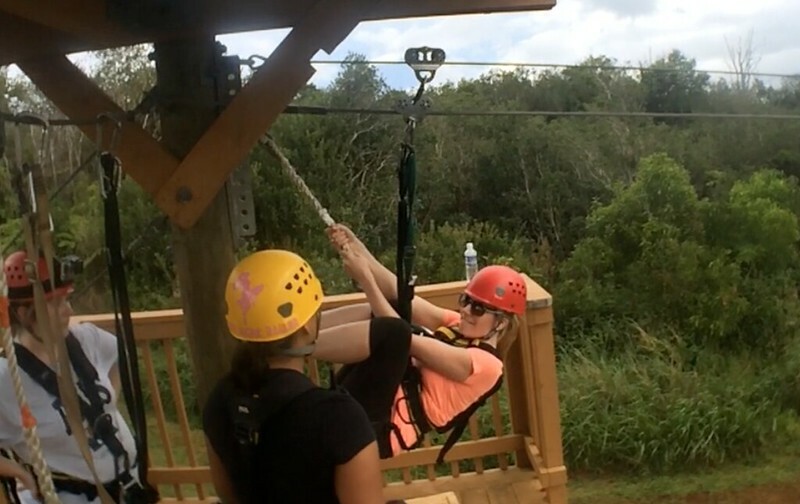 As if ziplining didn’t get our hearts pounding, we wanted to set the bar even higher (pun intended) with a helicopter tour of the area. 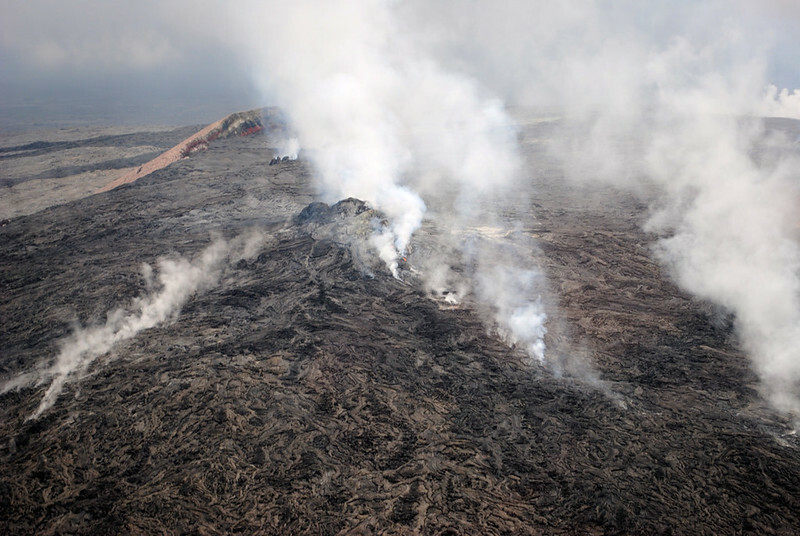 Often times the lava from the Kilauea volcano isn’t visible from the ground, so sometimes the only way to see it is from the air. 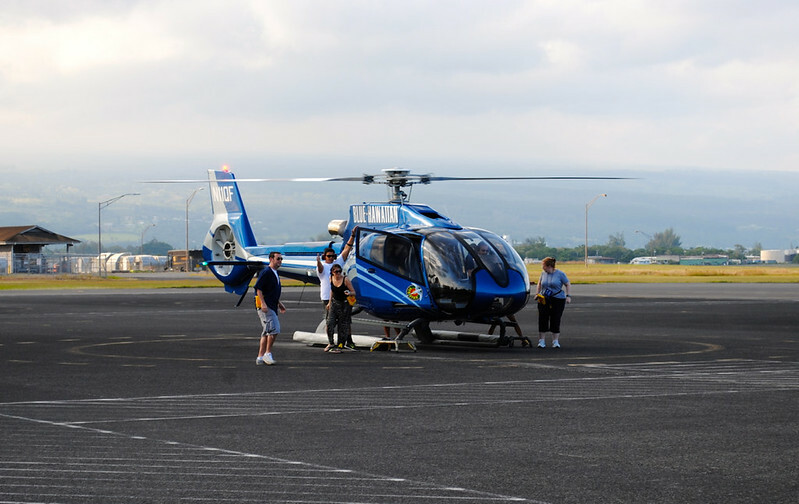 We had taken a tour with Blue Hawaiian Helicopters on Kauai, so we didn’t hesitate to book them again on Hawai’i Island. 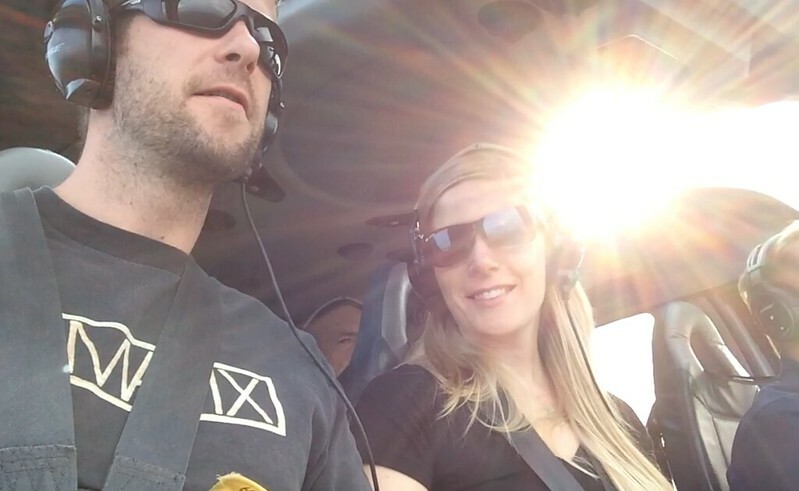 Their pilots are consumate professionals and the entire team is top notch. 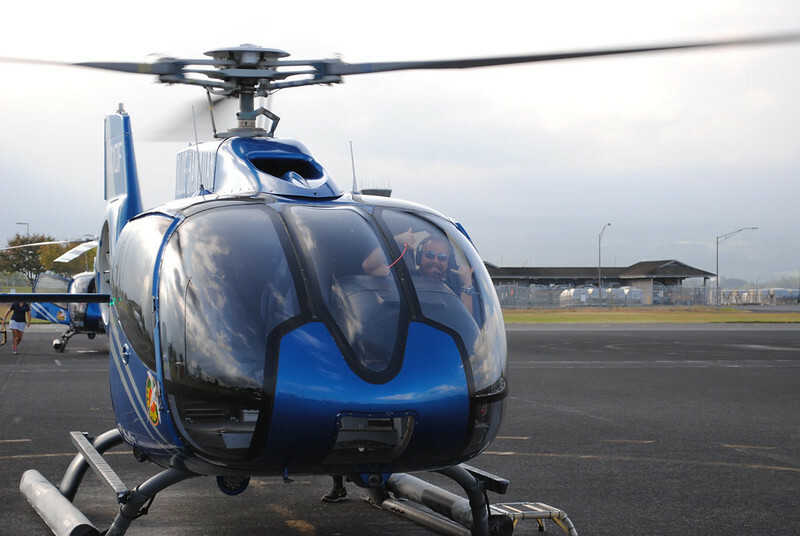 Our pilot was a former Air Rescue medic, so he was incredibly experienced in flying helicopters in any and all conditions. Delightfully cheesy, our tour began with the original Hawai’i Five-O theme song playing in our headphones, getting us excited for the flight. Circling Hilo once, we headed southwest over Puna and reaching the shores of Kalapana. 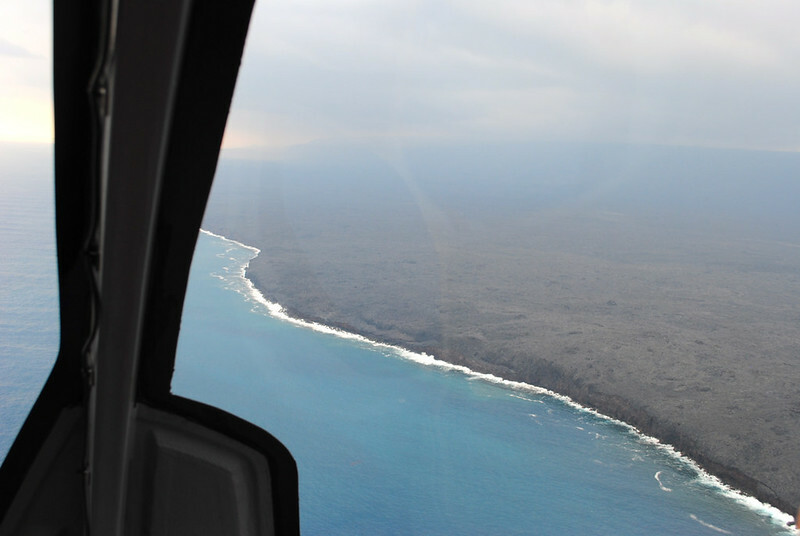 Seeing the shoreline from the air put the damage from lava into an entirely new perspective. What was most interesting was learning that, because of the lava flow creating new land, the shape of Hawai’i Island has actually changed from what we know it as on maps. Our pilot then steered us toward Pu’u ‘Ō’ō vent. Through the crusty surface, we were able to catch glimpses of the lava below. 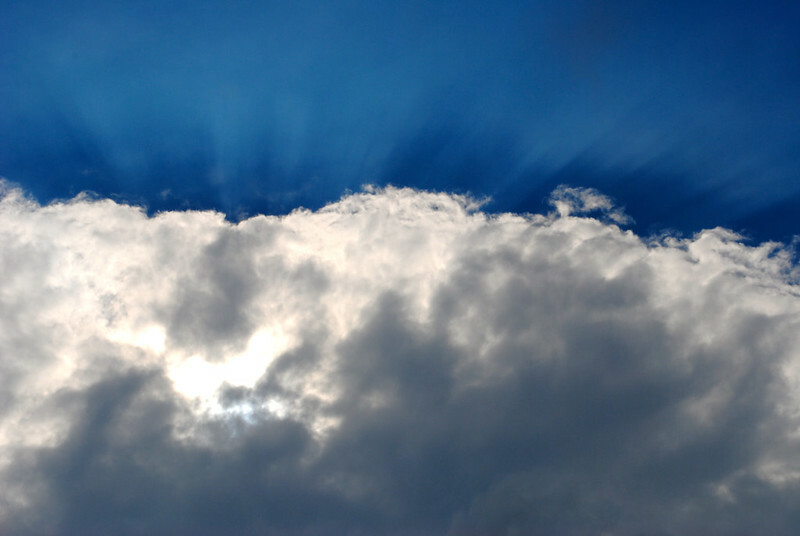 Smoke poured up through cracks in the earth’s surface, reminding us of what wasn’t too far below. 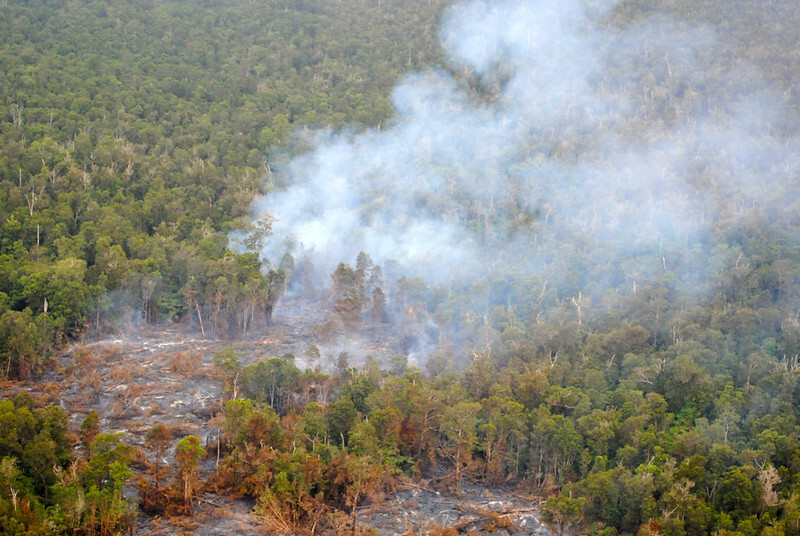 In fact, the lava was so close to the surface that it was actually burning trees from the roots up, causing a forest fire that to fight would have been futile. You can’t stop Pele when she’s awake. 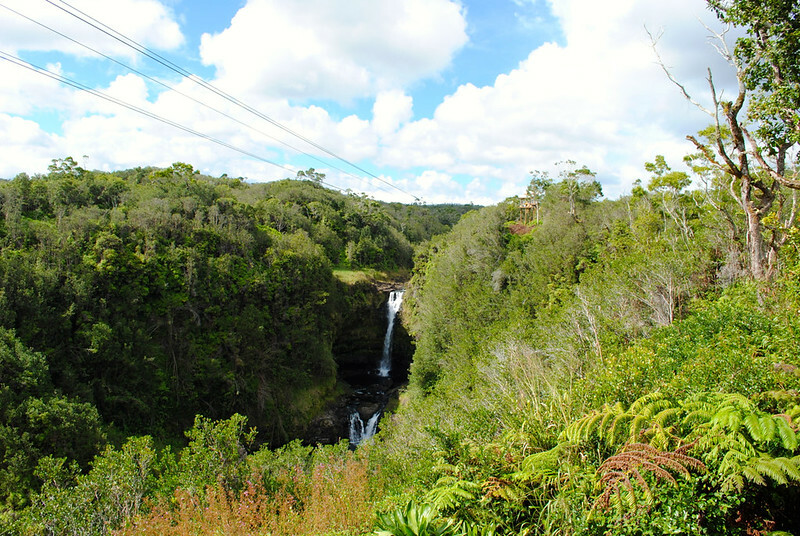 The tour ended over some of the towering waterfalls and dense jungle surrounding Hilo. As the city and its airport came back into view, I marveled at how incredible the little city by the sea looked from a bird’s eye view. 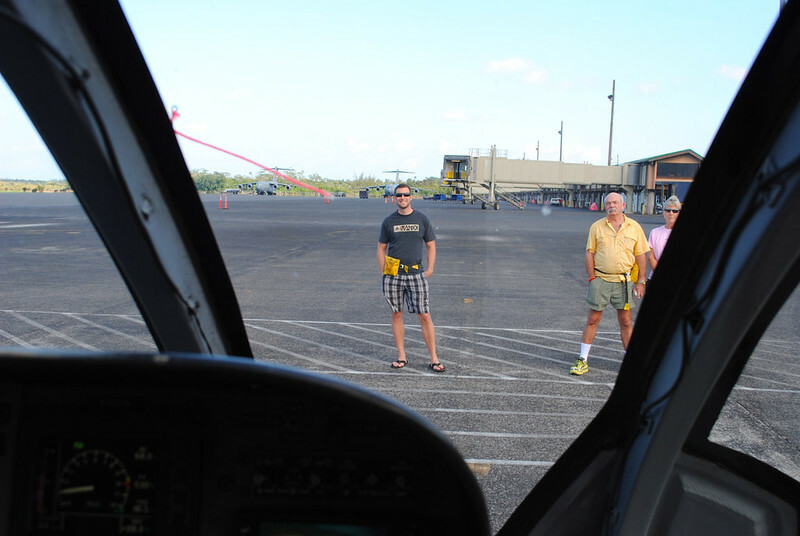 We thanked our pilot profusely and agreed that, next time, we’d see even more of the island from the air. 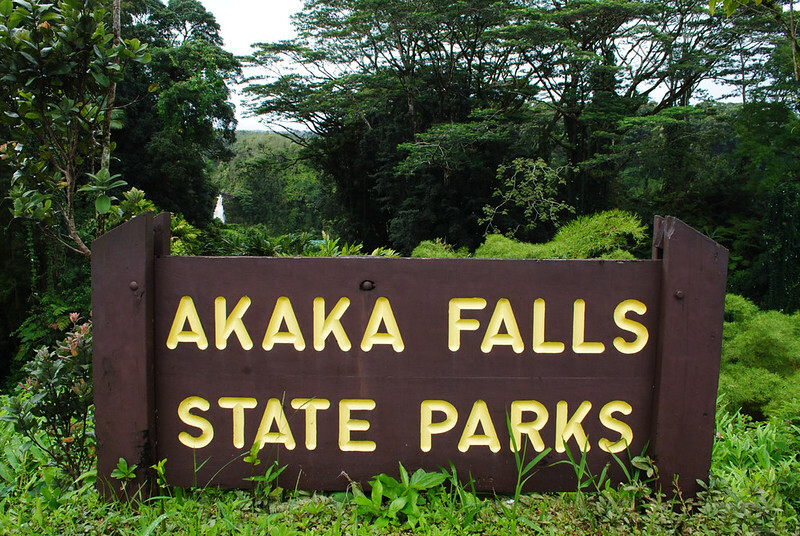 If ziplining and helicopter rides aren’t your style, and you’re looking for something a bit more laid-back, then head north on the Hawai’i Belt Road and stop in at Akaka Falls State Park. 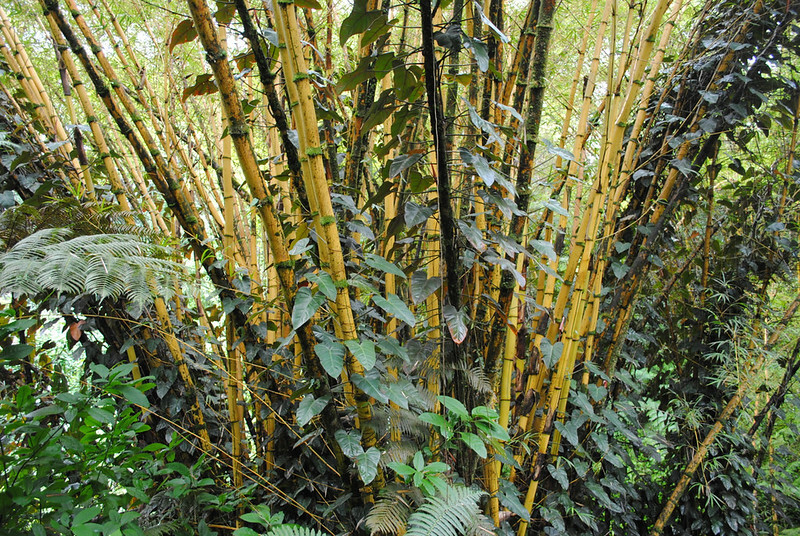 A short “hike,” if you can call it that, this 0.4-mile loop led us through thick bamboo, ferns, orchids, and tropical flora and fauna. 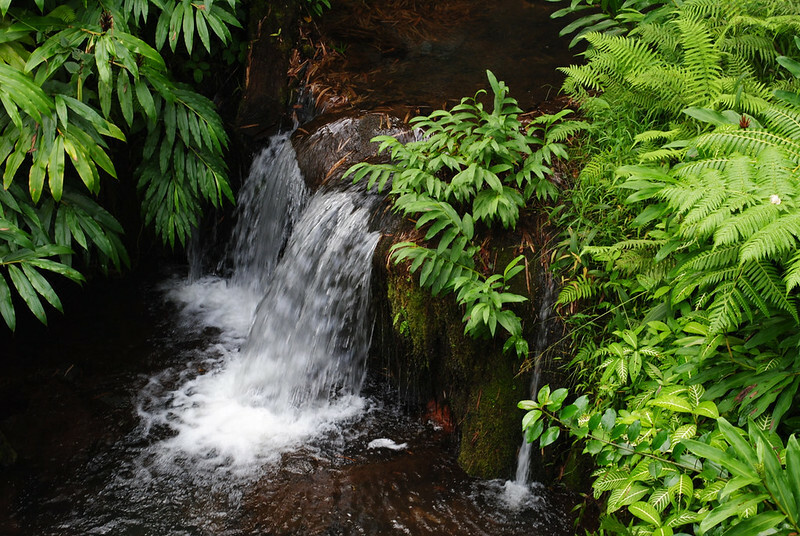 Kahuna Falls were visible through the trees, but Akaka Falls were the main attraction. 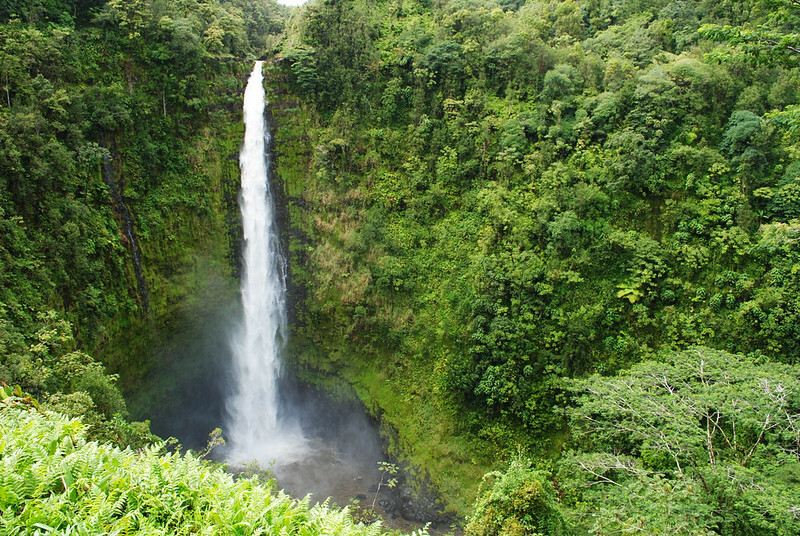 At more than 400 feet, Akaka Falls plummets almost further than our eyes could see, making for a postcard-perfect snapshot. 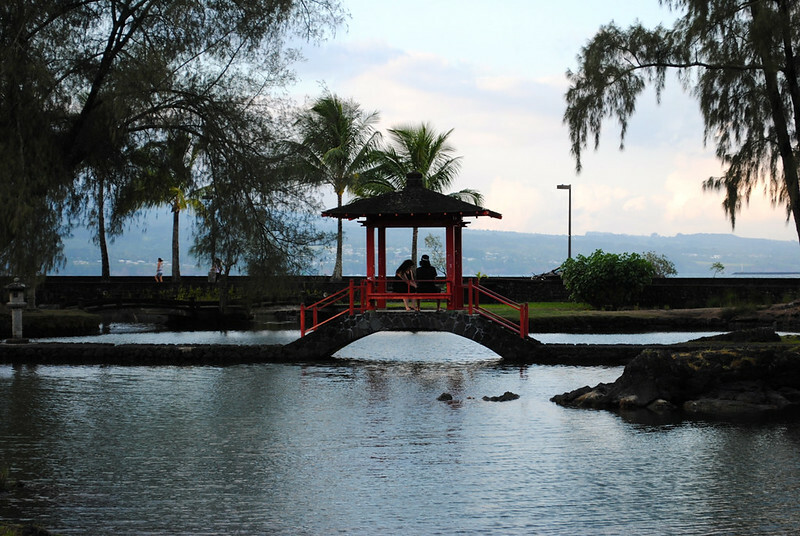 Getting to Hilo from Kona can be half the adventure. You can take the southern portion of the Hawai’i Belt Road, the northern portion, or cut directly across the island along Saddle Road. My favourite way is the latter of the three, passing through martian-like landscapes in the shadow of Mauna Kea. 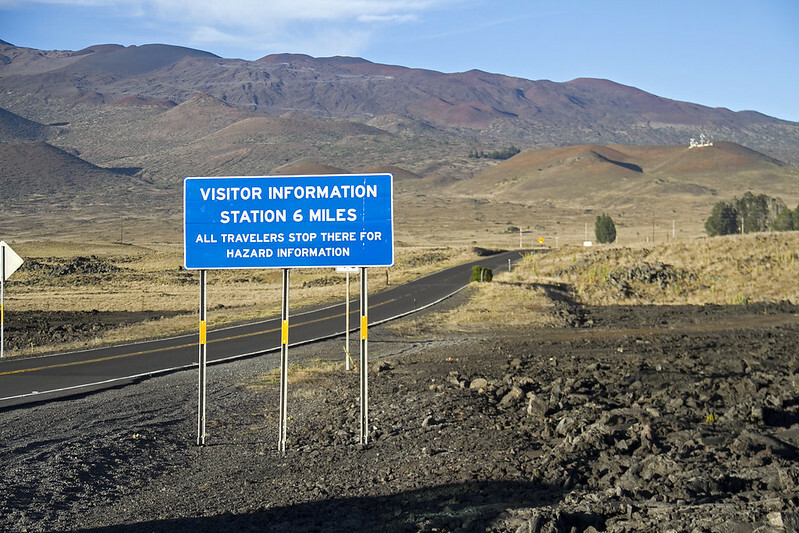 If time permits, make a point to stop at the Onizuka Center for International Astronomy Visitor Information Station. It’s a mouthful but worth the time. 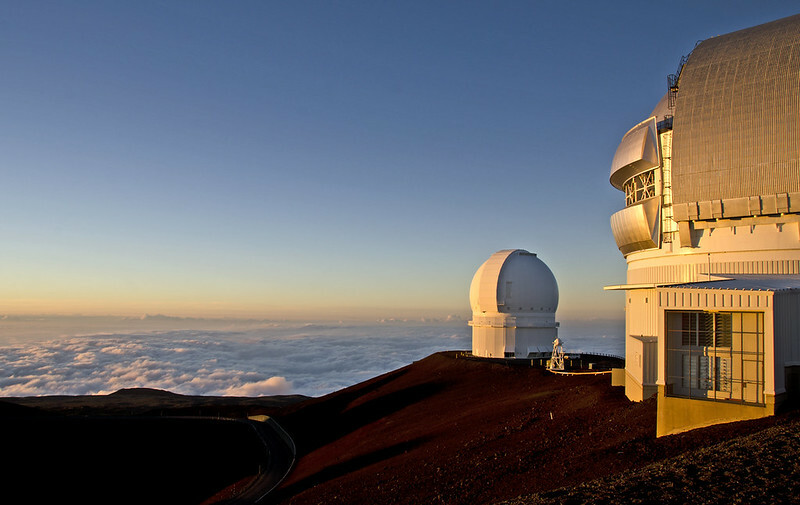 Travelling beyond the station to the summit of Mauna Kea is not permitted without a four-wheel-drive vehicle, so do as we did and book a nighttime observatory tour. However, don’t be surprised if you end up disappointed as we did, with the tour being unfortunately canceled due to weather. 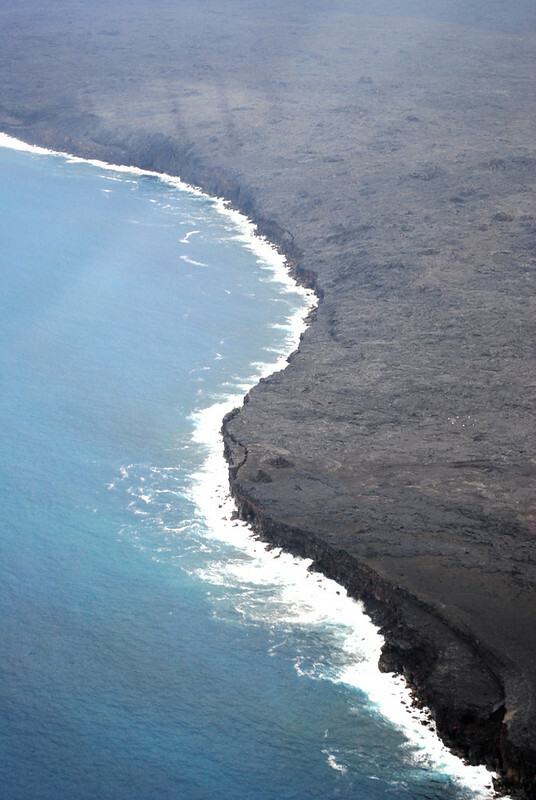 With 11 of the earth’s 13 climate zones present on the island, it’s not uncommon for Mauna Kea’s summit to be whipped by wind and even snow in the wintertime. On the plus side, not being able to visit the summit gives us more than enough reason to return to Hawai’i Island again in the future! My sweet tooth was blissed out by the inventive treats at Big Island Candies. Make sure you try the Chocolate Macadamia Nut Crunchies and then mail me some. Crazy delicious burgers and home of the Loco Moco, Cafe 100 in downtown Hilo is somewhere we stuffed our faces more than once. 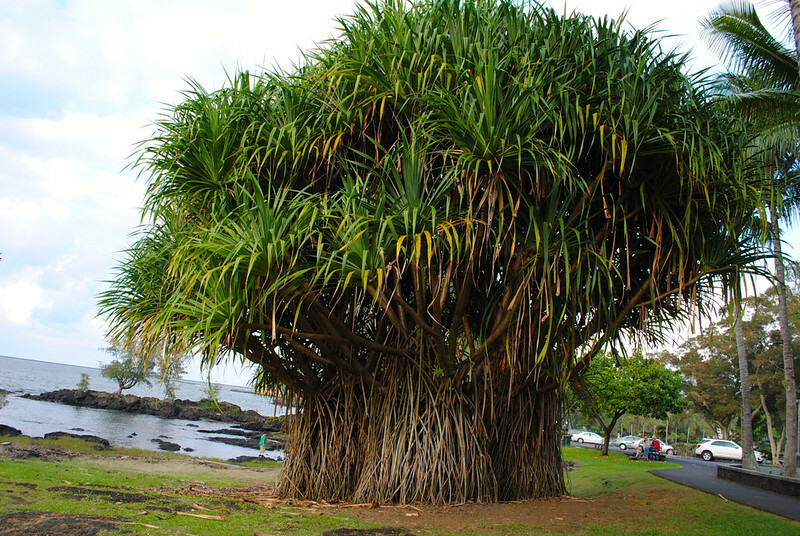 As if you’re not already unplugged in Hawai’i, a visit to Coconut Island and Liliuokalani Gardens (named after Queen Liliuokalani) is a must. It’s totally walkable – bring a picnic lunch. In the mood for more than a quick bite? Cafe Pesto is renowned as one of Hawai’i Island’s most local-centric dining experiences. I loved my Seared Poke with Spinach salad! Blink and you’ll miss it, but Kolekole Beach Park was a tranquil respite off the highway. North of Hilo and perfect for kicking off your shoes and relaxing, my husband couldn’t resist the rope swing over the river that the local kids use. I, however, could not/would not recommend it – use it at your own risk! 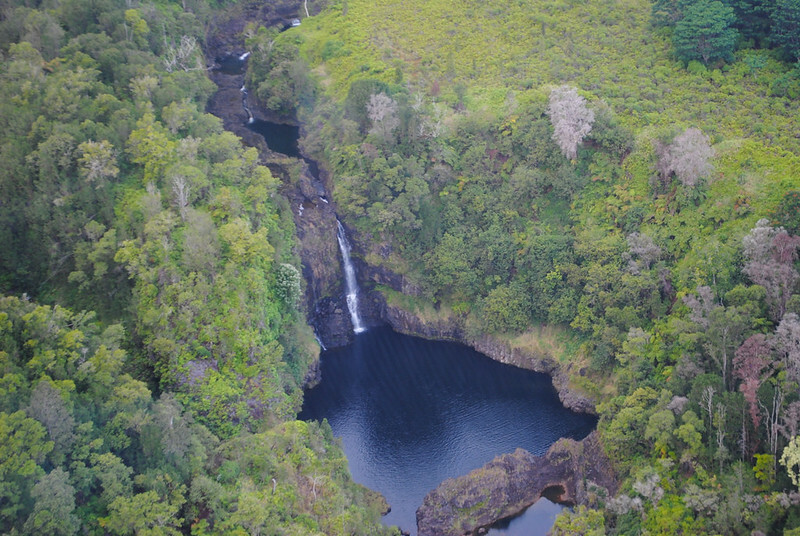 Join me next Tuesday as we finish our tour of Hawai’i Island with the Waipio Valley, Hawi, Pololū Valley, King Kamehameha’s birthsite, and the Kohala Coast beaches. Disclaimer: I was not paid or asked to write this post. All views and opinions are entirely my own.